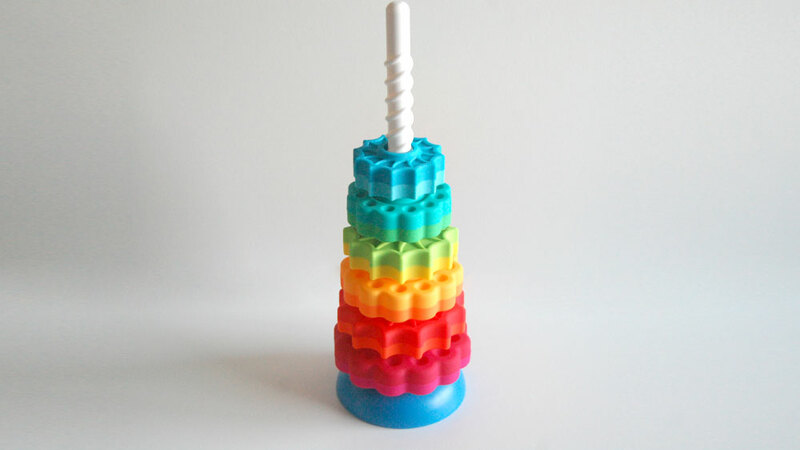 SpinAgain by Fat Brain Toys puts an inventive spin on the classic stacking toy. It’s impossible not to spin it again and again! It seems so simple but don’t overlook this toy. The spinning action will keep toddlers entertained for hours. Young children between the ages of 1 and 3 are able to do so many wonderful things with their fingers. 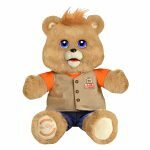 It is important to give them toys that help them build their fine motor skills. Stacking toys are a favorite developmental toy for children of this age. Stacking toys are great for building everything from fine motor to vocabulary skills. With no batteries, no beeps and bops, and no overstimulating lights, Fat Brain Toys has put an inventive “spin” on this classic toy. 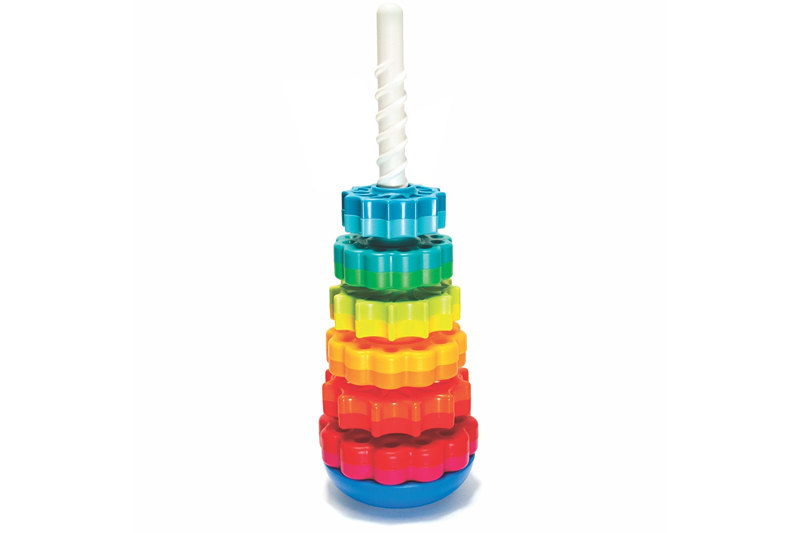 Traditional stacking toys feature plastic shapes that you stack on top of each other. 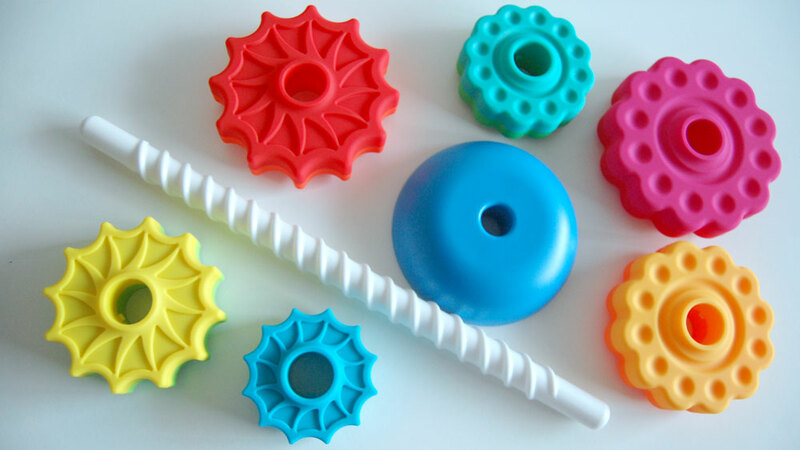 SpinAgain features six vibrantly colored gears of different sizes that spin downward on a central pole. 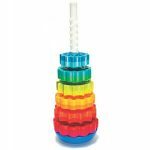 While this is a great developmental toy, there is something so mesmerizing and hypnotizing about watching the brightly colored gears spin around the spiral pole to the bottom. There is something so mesmerizing and hypnotizing about watching the brightly colored gears spin around the spiral pole to the bottom. For toddlers, it’s a lot of fun to spin the shapes on and off the pole for hours. It’s complete entertainment. When your child is asleep, you might even catch yourself playing with it. The six chunky, rainbow colored gears are perfectly sized for small hands. Picking up the gears and placing them on the spinning rod helps children learn to control their fingers and develop eye-hand coordination. When babies are crawling, there is nothing more motivating than a brightly colored tower. With a little creativity, there are so many ways to play. Along with building fine motor skills, it’s a great toy for introducing new words and concepts – including colors, counting, sequencing and more. Along with building fine motor skills, it’s a great toy for introducing new words and concepts – including colors, counting, sequencing and more. We like that you don’t have to stack the pieces in any particular order so even younger children who can sit up on their own can play. Around 2 years old, children will begin to be able to stack the gears in ascending order. For the most part, this is a really well-designed toy. Each gear has a little lip that allows it to grip the thread around the spiral pole. 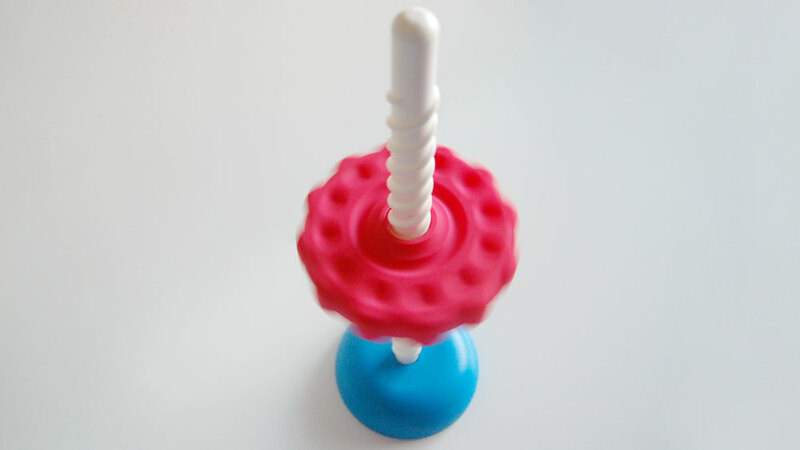 Using just gravity, the gear will spin smoothly around the pole, making a fun whirling noise. Depending on its size, each gear spins at a different rate. The smaller ones spin faster than the larger ones. 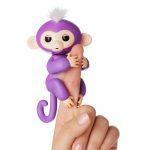 All of the pieces are made out of sturdy BPA free plastic, which means that they will be able to stand up to rough play. To provide a great sensory experience, each piece is textured with bumps and grooves. Constructed of hard plastic, the central rod sits loosely in the blue plastic base. The instructions state that the base can be flipped over but it seemed pointless and didn’t change the dynamics of the movement. Flipping the base just made it more likely to tip over. By design, the rod and base come apart very easily, allowing the bottom to fall off. This makes it easy to quickly spin off the gears from the bottom of the rod by lifting the rod out of the base. Then you can start all over again. It is best to play while sitting down. If you stand up, the gears will get scattered all around on the floor so be careful if you have wooden floors. Some children may need help putting the rod back in the base. Do you have a toddler that likes to turn everything into a weapon? Maybe, this is not a toy for your child. Since the rod comes off the base, some children might love swinging and waving the rod around as a sword. Since the rod comes off the base, some children might love swinging and waving the rod around as a sword. While the rod is rounded on both sides, it is important to teach your child that the rod should not be used as a weapon. You probably don’t want children sticking it in their mouth either, as it could present a choking hazard. We feel that the toy could have still worked if the rod was permanently attached to the base because when you flip the toy upside down, the gears spin off the top of the rod. The way it is designed, you have to be extra careful when moving the toy around. You have to pick it up by the base. If you pick it up by the rod, the gears will come crashing down to the floor. For this reason, this is a toy that is best played with while sitting on the floor. The biggest downside? The price! Compared to other stacking toys, this costs about 3 times more. Thirty dollars is a lot to ask for a stacking toy, but SpinAgain will likely keep your child entertained much longer than an ordinary stacking toy. Thirty dollars is a lot to ask for a stacking toy, but SpinAgain will likely keep your child entertained much longer than an ordinary stacking toy. Still, it is something that parents need to consider before purchasing this toy. It’s hard to call a stacking toy innovative but this is an innovative stacking toy. It’s simple but there is something so enthralling about watching the brightly, colorful gears spin down the pole over and over again. It’s impossible not to spin it again and again! Opinion: Is It Game Over For Toys To Life?